Edsel got a bad rap as far as I’m concerned. Heck, I wish they still made them. As a kid I thought Edsels were cool. I loved the big horse collar grille, the pair of twin headlights and those slim cat-eye taillights. This was styling extreme to the max in an age of styling extreme. It was an age where giant tail fins and portholes in the sides of cars were welcome. Who wouldn’t like this in your face design from Ford? Well, apparently nearly everyone, as the Edsel lineup fell flat on its crankcase and was discontinued just a few years later. 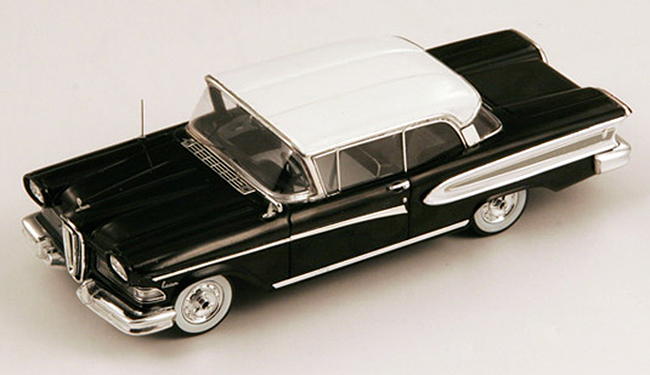 But styling fashionistas, those of us who appreciate styling daring do, can still get our fix via Spark’s new 1:43 scale Edsel Citation Hard Top Coupe. Spark recreates the 1958 model in black with a white roof, and the two-tone paint job just makes this all the more attractive because it reflects the fun and style trends of 1950s autos. Spark is no newcomer to 1:43 cars, it offers a variety from standard street cars to race cars of all ilk. Here’s what I like about this one. Chrome was king in the 1950s and this model absolutely glistens, from its shiny paint job to the chrome bumpers, mirrors, window trim and side styling cues, including a chrome rocker panel that stretches between the wheels. There’s also the fender-mounted antenna and chrome grate in front of the windshield with chrome wipers that fold over each other. Cool! Spark offers nice detail on the big gun-sight hood ornament, chrome vertical horse collar grille, realistic looking dual headlight lenses, rubber-trimmed front and rear bumper guards and dual exhausts. The tires feature gangster style wide white sidewalls and naturally chrome hubcaps with stylized spinners and a black center to match the car’s color. The outside mirror and door handles look are chrome too and the rear fender sweeps are chrome trimmed with white accents and silver ridged inserts with the Edsel name on them. This is the only spot where paint execution had a few minor flaws. The black and white interior looks sharp too with well detailed dash gauges and a black wheel with chrome hub and horn ring. In back is an Illinois license plate. Nothing opens on this model, so you don’t get to see an engine or flip open a door for a better view of the interior, but this is an attractive static model to put on your shelf next to your other favorite 1950s lead sleds. At $73.99 this is an attractively priced, well detailed model that allows you to spruce up your collection with a car that oozes style, if not success. Spark models are available through Replicarz (www.replicarz.com), which provided the review model.